So beginning next Thursday watch out because I’m going to let you know exactly what I think of my new xtenex laces (). Initial impressions are great! I had a call from one of the folks at xtenex earlier this week – I was charged for shipping & shouldn’t have been… so they sent me a pair on the house (technically speaking). They were super nice & took time to not only get to know me but to really tell me about the xlaces. A small company out of Denver, might just be the best kept secret for all runners – I’ll let you know next week as I’m racing in them Saturday night in the Rivershack 2 miler in New Orleans… Can’t wait! 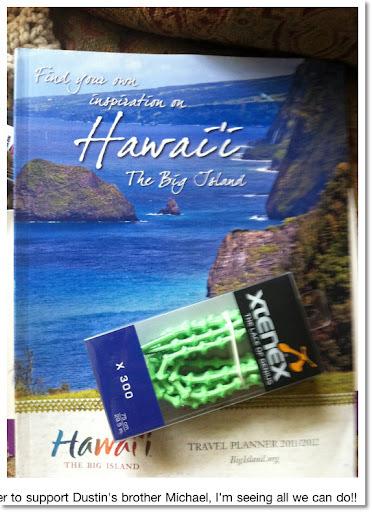 Xtenex laces and of course, I’m getting stoked for Hawaii and seeing what all we can do while supporting Dustin’s brother Michael in Kona!